Late on Thursday we got our MemChaser 0.3 release out the door. Compared to the last releases this version comes with a ton of new features and bug fixes. Most of them have been requested by users and from the JS team so we put some extra focus on those. As you can see in the image new ui elements have been added. The memory and garbage collector related items are equivalent to the buttons in ‘about:memory‘ and help those users who want to trigger a memory clean-up more often but don’t want to keep the before mentioned page open. 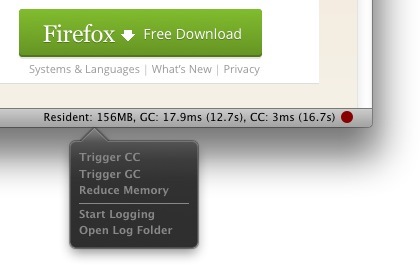 The reaction of Firefox and the updated memory and GC/CC values can be seen in the MemChaser widget right after the triggered action has been finished. Also we have updated our code which retrieves GC/CC related information to use the new Garbage Collector API. This allows us to get all the information and not have to scrape the console messages anymore for particular elements. That makes our life a lot easier and as benefit we can even store the complete set of data to the log file for further investigation. This log file is now a valid JSON file and will make it easier for you to analyze the data. If you wondered (with the former versions of MemChaser) where the log files have been stored, you can now open the containing folder via the new panel element too. If you are not satisfied with the location go ahead and change the target folder in the add-on preferences to any folder you like. To help new users of the extension to understand the entries in the widget, tooltips have been added. Those will inform you about the background of the individual values. This was a request by a couple of users so we wanted to have this included too. If you are interested in all the changes happened in the 0.3 release you can find the complete list as usual on our MemChaser issue tracker. This version of MemChaser has still been built on top of the Add-on SDK 1.5, because we wanted to get out all of those new features also to our Firefox 10.0 user base which is about 28% of all our users. This was more important to us compared to fixes we would have benefit from the SDK 1.6. But at this time we want to announce that version 0.3 will be the last release which officially supports Firefox 10. With version 0.3.1 which will be released in the next one or two weeks a version bump to the SDK 1.6 will be done to fix the before mentioned issues like memory leaks. If you are interested in helping us in the implementation of new features or fixing bugs, please check our issue tracker for open issues and contact us on IRC in the #automation channel.